Sales Motivation Video: Every Time You Get an Order, Print it Out! When you have a stack of orders with you, it is a visual reminder that you ARE successful in sales! Yes, every time you get an order, print it out! This is a great technique to boost your sales motivation as you move on to the next call. That stack of orders will help you push past your hesitation and move on to even greater sales success. 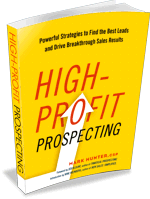 PrevPreviousIs Prospecting an Activity or a Lifestyle?